The ultimate Sunday Funday on the roof: a summer evening spent sipping, snacking, basking in beautiful city views and learning all about pollinators with Offline and Bee Downtown. Local bee keepers Bee Downtown will demo their clear hives so you can get up close and personal with the bee world (don’t worry, the bees can’t escape! ), pick up bee-keeping fun facts and learn about how Durham just became a Bee City USA, and they will also be selling their handmade honeys and soaps. 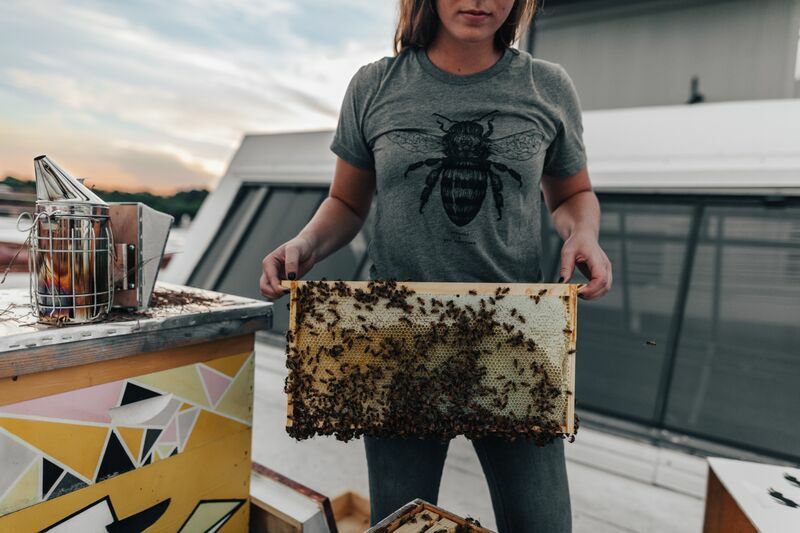 Check out honey-kissed menu specials and a raffle to win a free tour of the rooftop apiaries at American Tobacco Campus, with proceeds going toward Bee Downtown’s non-profit leg, which brings free bee hive demos and workshops to local elementary schools. Cocktails, vendors, honey and sweet views all for a great cause? Sounds like the perfect Sunday! No fee for entry. About that delicious, bee-approved rooftop menu—Offline members get a discount for a drink + app combo! Just show your Offline app (or Offline emails) to the bartenders and you’re set (1 per customer). To make a reservation for a group of 6 or more, call 919-768-8831.